Outside my window... I see ladders joining to make a walkway for the roofers to work. I am not so sure that it is the safest I have seen but they have been doing this for years so they must know best. I am thinking... That it is quiet and peaceful. It is also a beautiful fall day again which I give thanks for. I am still working on teaching the babies to count and recognize letters. The babies also have a teacher Mrs Judy that comes once a week and we go to socialization 2 times a month. James is working on drawing horizontal and verticle lines. Sierra is working on walking up and down stairs using one foot per stair. Matthew is working on scribbling. The teacher will be here tomorrow and give us another new plan for the week. Kate is caught up on her homework however I found that Megan is now behind on hers and will need to work on getting it caught up all week. In the kitchen... I am planning on making a stuffed green pepper casserole today for my recipe of the week. I will let you know how it turns out. I seen one somewhere and like always am adapting it to fit my needs. It looks so much easier than stuffing them. I am wearing... my Michigan t-shirt and a pair of jeans that actually fit over my booty. Yes! These days it seems that all jeans show your booty. I am creating... a new chart to keep track of the kid’s earnings for our family store. The one I have is not quite working properly. I have tried quite a few and will someday find the best one. I am going... to school conferences today. I am wondering... what those test results will say and how long it will take to get them back. I am so inpatient and sick again today with a fever. I am reading... nothing at the present. I have not picked up the one I was reading. 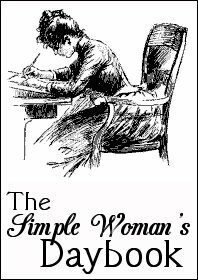 (Resolution for women) I got side tracked getting 4 free children’s Christian books for kindle and doing book reviews on them. I love the free books program I am in and so does my husband as it saves me buying them. I am hoping... that I can get a nap today as I am TIRED. I took Nyquil I know it feels like I am always napping and sick for a few weeks now but I am sure we will get to the bottom of this and I will get back to normal. I am looking forward to... getting our house sided soon. I will feel better about the appearance of the house as I am embarrassed by how ugly it is. That is what we get for buying an old house to fix up. I am hearing... an occasional car drive by; men talking that are on my roof, ladders rustling and the brand new fridge making an awkward noise. Hmmmm? Ahh.. it is just the ice maker thankfully. Around the house... although it seems to be taking us forever we are slowly getting the remodeling completed. I am pondering... nothing... I have nothing but plans in my head right now. One of my favorite things... is blogging. A few plans for the rest of the week: Makes some phone calls, Watch as the roof gets constructed, Election Day, Veterans Day celebration with the kids for our veterans in the family, try out another church this week. 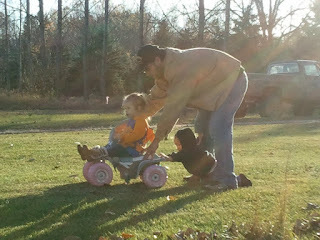 Sierra being pushed by Matthew and Daddy when we visited papa on Sunday.